Get a head start on Cyber Monday with the best deal of the year from our partner O’Reilly Media. Shop 12,000+ titles from 30 of the world's most trusted publishers, including hundreds of titles on data so you can get what you need to put the power of big data at your command. From data collection techniques to data visualization and analysis, find it all with ebooks and video training from shop.oreilly.com. Ebooks and video training from shop.oreilly.com are DRM-free. You get free lifetime access, multiple file formats, and free updates. Sync with Dropbox and Drive—your files, anywhere. P.S. 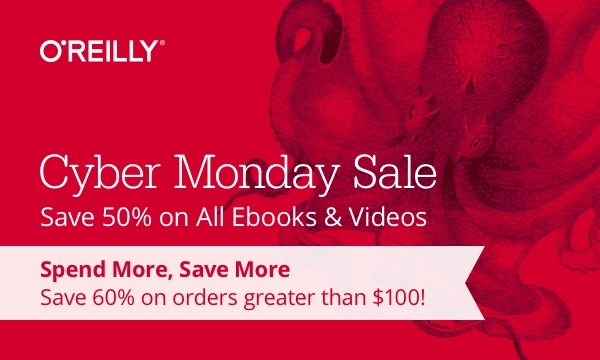 - As part of O'Reilly's Cyber Monday sale, get all Learning Paths for just $99--and 50% off Safari subscriptions, for unlimited access to the largest technical, business, and design library on the web. (At $199 per year, get Safari for 55¢ per day--and lock in the rate for life. It's a crazy good deal). Use discount code CYBER15 – Deal expires December 1, 2015 at 5:00am PT, and cannot be combined with other offers. Offer does not apply to Print, "Print & Ebook" bundle pricing, or Learning Paths.